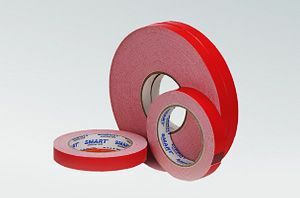 Double-sided tape on the support of white foam covered with a modified acrylic adhesive and protected with a red veneer exterior. Very good adhesive allows you to get a good consistency with the glued surface. Tape is resistant to UV and aging. Suitable for all vertical applications with moderate load, recommended for indoor use. Very useful in industry, small-scale manufacturing and services (furniture, plastic products, automotive, home improvement and many others).